RABWAH, Pakistan (UCAN) — An Ahmadi place of worship has been seized by authorities in what minority religious communities fear is a further erosion of pluralism in the country. Concerns were raised after a large police contingent handed over a disputed worship venue in Rabwah to the majority Sunni Muslims on Jan. 14. 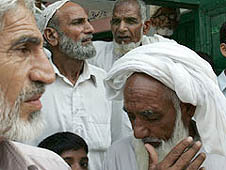 The place called Bait Noor had been sealed in 2003 to prevent clashes between the two Islamic groups over its ownership. Many Muslims regard the Ahmadis as a heretical Islamic sect. Catholic human rights activists have condemned the recent anti-Ahmadi move. “It is a sad happening under the elected government of Punjab province. The sheer negligence of authorities is threatening the freedom of religion,” said Alvin Murad, executive secretary of the major religious superiors’ justice and peace commission. Peter Jacob, executive secretary the Catholic bishop’s National Commission for Justice and Peace, agreed. “We disapprove of such treatment of minorities. Some political figures, belonging to the mainstream, are accused of backing this decision,” he said, adding that the authorities have once again proven to be insensitive to religious diversity. “It is indeed the whittling of pluralism in the country. Extremism has many manifestations and discrimination is being institutionalized,” Jacob told UCA News. Saleem-ud-din, the Ahmadi community spokesperson, demanded justice from authorities in a Jan. 21 press release. “This is a blatant display of the weakness of administration, and lawlessness. We had presented legal documents of the late Ahmadi who built [the worship venue] on a piece of land he owned and various local politicians had submitted written statements supporting our stand,” he said. “The management of Bait Noor was under the Ahmadi community for 20 years after it was built in 1983,” he told UCA News. This was the 15th forcible occupation of an Ahmadi place of worship since the promulgation of Ahmadi-specific laws by President General Zia ul-Haq in 1984. Under these laws, Ahmadis are prohibited from engaging in “anti-Islamic activities,” including propagating their faith, and using Muslim worship practices and greetings. The Ahmadi movement was founded in the late 19th century by Mirza Ghulam Ahmad. While all Muslims hold Jesus Christ in high regard as a prophet, the Ahmadis have the unique belief that he survived the crucifixion and traveled to India to continue his ministry among the Lost Tribes of Israel. They claim that a tomb containing his body has been discovered in India.